Nestled in the Rocky Mountains, Wapiti Lake Provincial Park with its fast flowing rivers, crystal clear lakes and surrounding mountains provide outstanding scenic viewing, fishing and wilderness camping opportunities. 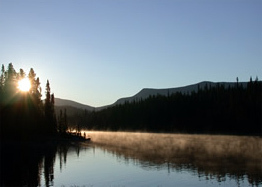 At Wapiti Lake visitors have the choice of tenting or using the backcountry cabin. Please keep this cabin clean and in good condition for the next visitor. This is a mountainous wilderness area. Terrain is rugged and weather can change quickly. Expect minimal or no contact with people. Other than the shelter at Wapiti Lake, there are no facilities. Those venturing into this area should be experienced backpackers. Be prepared for an extended stay if necessary. Advise friends or relatives of your trip duration and destination. Wapiti Lake Provincial Park is located about 60 km south of Tumbler Ridge in the upper portions of the Wapiti River drainage. It is accessed via the Ojay Main Road. Follow this road to kilometre 29 and turn right onto the 2500 road (at approximately 25 km) a road that leads to an old well site. The trail starts at the southwest corner of this site. The trail is approximately 19 km and follows the north side of the Wapiti River and the shores of a few smaller lakes. A view of Wapiti Falls can be achieved by following a short 200 metre trail off the main trail at kilometre 7. Be sure to bring your camera, as the scenic views are plentiful. History: First nations were the earliest people to access this area and have trapped in the Wapiti for many years. In the early 1960s, a local helicopter pilot built the original cabin at the lake. The pilot’s cabin eventually succumbed to the ravages of hungry porcupines and time. In the late 1960s, a Catholic Priest prepared a retreat area where spiritual restoration could be obtained. The priest and many others made numerous treks into the solitude of the Wapiti Lake wilderness. In 1983 the BC Forest Service and a Katimivik youth crew upgraded many kilometres of the trail. In 1995 a new cabin was built overlooking the lake. The area was recommended for park status in the Dawson Creek LRMP process and in June 26, 2000 it was established as a Provincial Park. Cultural Heritage: First Nations of the Treaty 8 Tribal Association have traditionally used the area. Conservation: Significant stands of old growth spruce forests blanket the slopes of the Hart Ranges in this part of the Rocky Mountains. Important habitat for numerous large species such as mountain goat and grizzly bear can be found in the park's diverse topography. The park’s tributary streams, rivers and lakes contain numerous fish species. Amongst them, and of particular importance provincially, is the bull trout, a blue listed species. Internationally significant fossils from the Triassic Period have also been uncovered within the park. Fossilized primitive ichthyosaurs found in the area have been found nowhere else on earth. Examples of other ichthyosaurs found in the Wapiti area have also been found in far off locals such as China and Japan. Wildlife: An abundance of wildlife can be viewed in Wapiti Lake Provincial Park. Moose are common ungulates found in the park’s many valley bottoms and marshes. Mountain caribou, although less frequently observed, are also found in the park. In the rocky ledges high above the lake, mountain goat can be observed. Both black bear and grizzly bears wander throughout. Wolves, coyotes, lynx and many small mammals pass through or reside in the park. There are canoeing and kayaking opportunities at this park. Canoeing and kayaking opportunities exist on Wapiti Lake and along the Wapiti River. Reminder: the river has rapids and waterfalls which should be portaged around. Prior to paddling down river have detailed maps and an excellent knowledge of all water hazards. The largest of the hazards to portage around is Wapiti Falls. There are fishing opportunities at this park. Anyone fishing or angling in British Columbia must have an appropriate licence. Bull Trout and Mountain Whitefish are present in Wapiti Lake. Bull trout are a species of special concern and as such have special regulations for fishing. For current information please refer to the BC Fishing Regulation synopsis. The Wapiti Onion Trail crosses through the park. This 30 km trail is located on the East slope of the Rocky Mountains and is open for hiking and horseback riding. The first 19 km of the trail to Wapiti Lake follows the north side of the Wapiti River and the shores of a few smaller lakes. Scenic views are plentiful, especially while along lakeshores. There is a short side trail (200 metres) to Wapiti Falls at 7 km. A reasonable goal would be to reach Wapiti Lake in day one. Backpacking time to Wapiti Lake is variable and depending on your level of experience allow 6-9 hours for the one way trip to km 19. The trail from Wapiti Lake to Onion Lake ascends steeply into the alpine. The 2 km climb above Wapiti Lake has an elevation change of 1000 metres. Between 24 and 25 km there is a terrific view of both Wapiti Lake to the south and Onion Lake to the north. At this point the trail descends 500 metres to Onion Lake. Allow 7-10 hours for the trip from Wapiti Lake to Onion Lake. Horseback riding is allowed in Wapiti Lake Provincial Park. Horses are permitted on the Wapiti Onion Trail. At km 19.2 an area in which horses can be tied has been established. Wapiti Lake Provincial Park is open to hunting. Hunters going into Wapiti Lake Provincial Park should reference the BC Hunting & Trapping Regulations Synopsis. Reminder: ATVs are not permitted on the trails or within the park. A viewpoint of Wapiti Falls can be accessed via a short 200 metre trail at km 7. Cross-country skiing and snowshoeing opportunities exist along the Wapiti Onion Trail. At km 19.2, a BC Parks cabin is open for public use. There is no charge and firewood is provided. The cabin can accommodate four people comfortably. The cabin is on a first come, first served basis. If the cabin is in use, please be prepared to camp outside. This developed area also has tent pads, a pit toilet, a fire ring and food cache. If you use the shelter, please keep it clean, remove your litter, and sign the guest book. Campfires are permitted. Firewood and a fire ring are provided at the designated camping area and backcountry cabin located on the northwest side of Wapiti Lake. While campfires are allowed and campfire rings are provided at each campsite, we encourage visitors to conserve wood and protect the environment by minimizing the use of fire and using campstoves instead. Firewood can be purchased in the park or you may bring your own wood. Fees for firewood are set locally and may vary from park to park. Limited burning hours or campfire bans may be implemented. To preserve vegetation and ground cover, please don’t gather firewood from the area around your campsite or elsewhere in the park (this is a ticketable offence under the Park Act). Dead wood is an important habitat element for many plants and animals and it adds organic matter to the soil. This park only has pit toilets; no flush toilets. A pit toilet is provided at the 19.2 km camping area. Visitors to Wapiti Lake Provincial Park can park vehicles at the trail head parking area which is accessed via the Ojay Main Road. Follow this road to kilometre 29 and turn right onto the 2500 road (at approximately 25 km) a road that leads to an old well site. The trail starts at the southwest corner of this site. From this point on, the park is located 13.8 km along the trail. Prior to reaching the park boundary, there is a rustic camping area at km 11.5 along the Wapiti River and another at km 12.8 on the shores of Lost Moraine Lake. The next two camping areas are located overlooking Wapiti Lake. The first is at km 16.0 followed by another at km 17.5. At km 19.2, a BC Parks Cabin is open for public use. The cabin can accommodate four visitors. This developed site also has tent pads, a pit toilet, a fire ring and food cache. Please be prepared for tenting in the event that the cabin is being used by other visitors. All campsites are available on a first come, first-served basis. Winter camping is available to experienced backcountry recreationalists. Visitors to the area can snowshoe or ski in to the area. The cabin at 19.2 km remains open throughout the winter.